Galveston beachfront on the morning of January 3, 2014, with much more beach exposed than is usual, due to high, steady northerly winds. Under the circumstances, now seems like a good time to revisit a post I did about a year ago, on this somewhat unpleasant phenomenon. Morgan’s Point and Clopper’s Bar, as shown on an 1856 U.S. Coast Survey chart of Galveston Bay. The soundings are in feet; any unusual reduction in the water level in the bay would make the bar impassible. They most frequently occur after a few days of damp dull weather, and generally about once a fortnight. Their approach is known by a dark bank rising on the horizon, and gradually overspreading the heavens. The storm bursts forth with wonderful suddenness and tremendous violence and generally lasts forty-­eight hours; the wind after that period veers round to the east and southward, and the storm gradually abates. During the continuance of a norther, the cold is intense, and the wind so penetrating, it is almost impossible to keep oneself warm. We had a norther here last week, a weather front that blasted through the area on the night of Wednesday/Thursday, part of the same front that caused hideous and deadly dust storms on the South Plains in Lubbock earlier. Down here, over 500 miles away, it left an orange dusting on cars and houses. Driving down to Angleton in Brazoria County along the Gulf on Thursday afternoon, my vehicle was continually buffeted by 25- to 30 mph winds, and an occasional higher gust, at a right angle to the road, pushing the car to the left, toward oncoming lanes of traffic. Not real fun. Wind speed at Morgan’s Point. This little chart shows the wind direction and speed for the period beginning about 4:30 a.m. on Thursday. The red dots show the sustained wind speed (scale on the y axis), while the blue arrows show its direction. For most of the period, right up until about 6 p.m., the wind blew steadily and consistently from the NNW at between 15 and 25 knots (17.3 to 28.8 mph), with gusts above that. This chart shows the air temperature at Morgan’s Point, from about 4:30 a.m. Thursday until late that evening. As the front passes, the air temperature drops almost 20° F in the space of a few hours. It climbs back up during the day, but not nearly as high as it had been, before falling again after sunset Thursday. This chart shows the water levels at Morgan’s Point, from about 4:30 a.m. Thursday until late that evening. The narrow blue line represents the predicted height of the water at the tide gauge; it wavers a little bit based on the natural flow of the tide, which has a small normal range at that point. The red X marks are the actual, observed height of the water, which drops steadily with the wind over a period of about twelve hours, before leveling off and holding steady at more than two-and-a-half feet below the point known as “mean lower low water” (MLLW), the low-water standard that is used for navigational purposes. Note that the wind also wiped out almost any of the normal rise in the water level expected due to tidal action. Here, closer to the Galveston Bay entrance, tidal action has more effect, but the water level remains more than two feet lower than predicted. This chart, plotting data from a buoy at the entrance to the bay, reveals an almost identical profile to that from Pier 21. Here, again, eighteen hours after the passage of the front, the water remains more than two feet below its predicted level based on tides alone. These three charts show (top to bottom) wind speed and direction, air temperature and water levels at the entrance to Galveston Bay, for a 72-hour period ending about 10:30 p.m. on Thursday. Comparing these, it’s easy to see when the front passes in the early morning hours of Thursday, prompting dramatic changes in the wind, air temperature and water levels. Finally, one last chart, showing the sub-surface currents at the entrance to Galveston Bay, at 14, 21 and 27 feet (4.3, 6.4 and 8.2 meters) below the surface. You can see the normal tide effect for the first 48 hours on this chart, as the current shifts between a flood tide (above the dashed line, water going into the bay), and an ebb tide (below the dashed line) as it flows out again. Although the wind only acts on the surface of the water directly, the momentum it generates there is carried through into much deeper water, dramatically altering flow of water so much that even at a depth of 27 feet, the normal tidal action is so completely erased that it results in a net ebb of the tide, a full eighteen hours of water emptying from Galveston Bay into the Gulf of Mexico. How much water got “blown out of the bay” on this occasion? Some (very) rough estimates are possible. (Check my math, y’all.) If we take the difference between the predicted and observed water levels at the head of the bay (Morgan’s Point, -2.57 feet) and entrance to the bay (Galveston Bay Entrance, -2.08 feet), we can average between them a value of -2.33 feet. If we take that figure as representative of the water level of the bay as a whole (and that’s a big “if,” admittedly), then we can convert that vertical dimension into the volume of water it represents. Galveston Bay encompasses about 600 square statute miles. One square mile is 27.88 million square feet; 600 square miles is 16.73 billion square feet. Multiply that by a depth of 2.33 feet, and you get a total volume of water of 38.98 billion cubic feet (1.1 billion cubic meters) of water. That’s a lot of water; it would fill a cube-shaped aquarium 3,390 feet (1,033 meters), over a half-mile long, on each side. The water would weigh something on the order of 1.24 billion short tons, or 1.13 billion metric tonnes. A 3,390-foot cube of seawater, approximating the volume of water blown out of Galveston Bay during the norther on December 20, 2012. Shown to scale are (top) a large, full-rigged sailing ship similar to Cutty Sark, (right) the statue of Liberty, and (left) the Petronas Towers in Malaysia, among the world’s tallest structures. So much for the numbers. What does this mean in practical terms for navigation on Galveston Bay? Today, weather conditions like these still pose a problem, particularly the wind, which poses significant challenges for large vessels transiting the Houston Ship Channel. I suspect the problem is worse for down-bound vessels than up-bound, as the former are running with the wind and current, and are thus much more difficult to maneuver. In the mid-19th century, the challenges of foul weather on the bay were substantially worse. The riverboats that ran between Galveston and Buffalo Bayou, Cedar Bayou, or the mouth of the Trinity River were very vulnerable, with their high superstructures and chimneys to catch the wind from any angle. (The little sternwheeler C. K. Hall, carrying a load of bricks out of Cedar Bayou, was sunk in just such a situation in 1871.) But the bigger problem then, before major dredging operations had established a deep and stable channel, was the depth of water over obstacles like Clopper’s Bar and Red Fish Bar, a nine-­mile-­long oyster reef curving in a gentle, east-­west arc stretching completely across Galveston Bay, almost exactly halfway between Clopper’s Bar and Galveston Island. Red Fish Bar could, on occasion, cause significant damage to vessels, and at least one steamboat, Ellen P. Frankland, would be wrecked on the obstruction in the 1840s. Both Clopper’s Bar and Red Fish Bar could be crossed regularly by vessels drawing less than four feet, but this depth of water varied with the tide and weather. Red Fish Bar, as shown on an 1856 chart of Galveston Bay. Soundings are given in feet. I doubt that most of us in this area paid too much attention to the weather Thursday, apart from the inconvenience of the sudden drop in temperature and the wind. But it’s good to keep in mind how dramatically similar events sometimes affected the day-to-day lives of people in the past, and how fortunate we are to be sometimes that much more removed from them. Harlan would depart New Orleans again on June 17. By running four ships on a schedule like this, there was a steamer departing each port every three or four days. Recall that at this time, there was no rail connection between Texas and the rest of the United States — that came later. The trip between Galveston and New Orleans is a long car ride now, but 150 years ago, a two-night trip aboard a coastal steamer like Harlan was both the fastest and most comfortable way to make the journey. Harlan was the last of seven ships built to the same design by Harlan & Hollingsworth for the Morgan Line between 1861 and 1866. The first of these ships, St. Mary’s, was purchased new and converted into the Union warship U.S.S. Hatteras. In 1880, Harlan transported former President Grant and his party from Clinton, on Buffalo Bayou near Houston, to New Orleans. Full-size images available on Flickr. 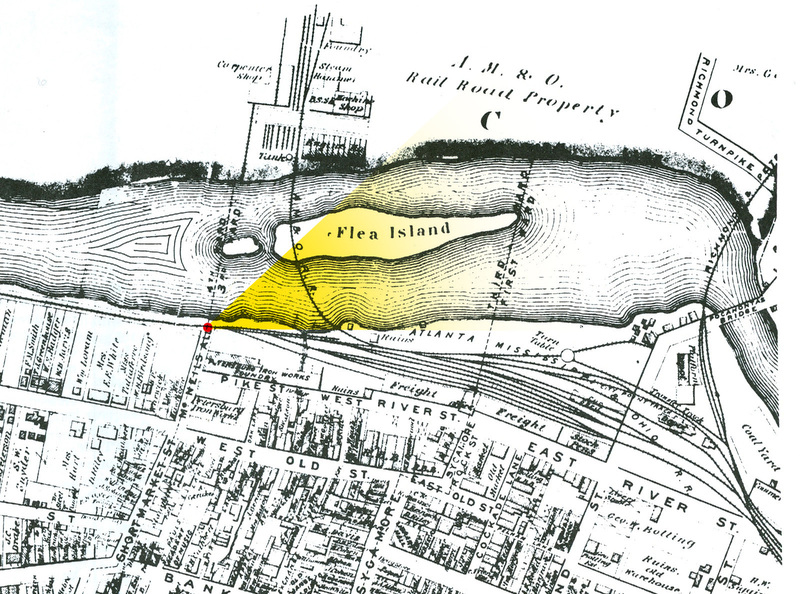 Attached is a copy of a map showing the bridges across Flea Island. [Download full size here.] 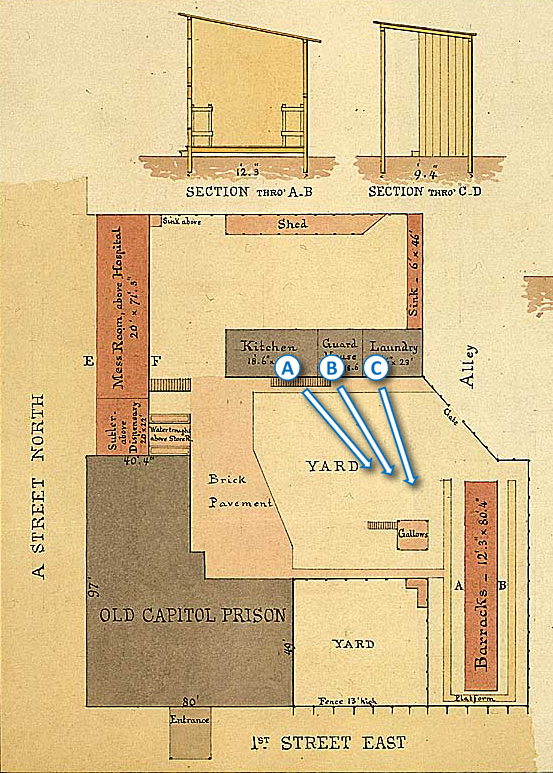 This is from the F. W. Beers map of Petersburg in 1877. The train photo appears to have been taken at the north end of McNeils Alley looking east towards where the turnpike enters Pocahontas. The map shows the Southside shops on the north bank of the Appomattox River. Note that the map shows that in 1877 the Richmond & Petersburg Railroad crossed the Appomattox River west of the Pocahontas Bridge. During the Civil War, the railroad crossed to the east of the Pocahontas Bridge. Today the river flows north of Pocahontas, about where the word “Turnpike” is written on the Richmond Turnpike. An extension of Second Street to where the word “Richmond” is written on the Richmond Turnpike is where the Route 1 Bridge is today. Where the R & P bridge crossed the Appomattox in 1877 is where Joseph Jenkins Roberts Street loops today into Pocahontas. The second attachment is a photo showing what the site looks like today. The southern river channel was filled in and is now covered by the Norfolk Southern track and a parking lot. Hope this adds to the interpretation. Passengers at Hanover Junction, Pennsylvania, one of several images in the Library of Congress collection. I believe these pictures were taken on November 18 or 19, 1863, and may depict passengers stuck at Hanover Junction, unable to continue on to their intended destination at the dedication of the new National Cemetery at Gettysburg. See an enlargement here. UPDATE: Scott Mingus got there first. We talked the other day about the logistical difficulties of rail travel through wartime Richmond, Virginia, which was served by fine railroads, none of which connected to any another. As I mentioned in the piece, that was a common situation in the 1860s, across the country. As Bob Huddleston mentioned in the comments on that post, it was exactly that sort of situation in Baltimore that required the 6th Massachusetts to march through the center of that city, exposing them to mob violence in April 1861. This original trackage of the Hanover Branch Railroad became one of real historical interest. It carried the parties of President Abraham Lincoln and Pennsylvania Governor Andrew Curtin from Hanover Junction to Gettysburg on November 18, 1869, where on November 19, President Lincoln delivered his now famous “Gettysburg Address” at the dedication of the National Cemetery. The Northern Central trains carried President Lincoln from Baltimore and Governor Curtin from Harrisburg, the two groups meeting at Hanover Junction and proceeding together on the Hanover Branch to Gettysburg. The Gettysburg Celebration. Dedication of the Great National Cemetery. In company with many others, we took the train for Gettysburg, via Hanover Junction, on Wednesday morning, to swell the ranks of the thronging thousands who, prompted by curiosity and patriotism or drawn by the tender ties of love for the dead, were gathering there to witness and participate in the the grand and solemn consecration of the burying place of the nation’s dead. . . . The train n which we rode was filled to its utmost capacity, many being forced to stand on the platform throughout the journey. The passengers were from all parts of the country, and almost every loyal State was represented in each car. The accommodation of the roads — the Northern Central and the Hanover and Gettysburg — were by no means sufficient for the occasion, and all persons going to or from the scene of interest were put to great inconvenience in consequence. Some were unable to get beyond Hanover Junction on Thursday. We saw a party of over fifty persons, who had journeyed over six hundred miles for the express purpose of attending the dedication, which party lay at the Junction from nine o’clock in the morning until ten at night, unable to get a step farther. Not a train was run over the Hanover road during that time, and this the pilgrims, after coming six hundred miles to see the battlefield, were defeated in their enterprise on the last twenty-five miles. It is a matter of wonder that, with such timely notice, this road failed to make proper arrangements, and suffered the spirit of mismanagement to paralyze its workings. The LoC catalog listing provides no additional information on the date or subject of these images, but there are clues. The lack of vegetation on the trees suggests the images were made either early or late in the year. The clothing of the civilians is uniformly heavy, and mostly formal — these are not locals hanging around the depot to see who gets off the train. The soldiers all seem to be using canes, suggesting the effect of wounds. To me, these factors all suggest a date in late 1863. More specifically, I believe all three images are of parties traveling to or from the dedication of the National Cemetery at Gettysburg on November 18 or 19, 1863 — maybe Governor Curtin’s party, or perhaps the delegation that had come 600 miles to witness the festivities, only to find themselves stuck in Hanover Junction. Either of those would be obvious subjects for a photographer. I don’t know if Brady traveled from Washington to Gettysburg, but Alexander Gardner was there. He had broken with Brady and had his own studio in Washington by the fall of 1863, and Gardner likely would have followed the same route by rail from Washington to Gettysburg, changing at Hanover Junction. Could these be Gardner photos from that event, misattributed (as much of his work was) to Brady? Or did Brady, coming up from Washington, also found himself stuck at Hanover Junction on the day of the dedication, and occupied his time shooting images of his fellow stranded passengers? Several pieces of the ship’s compass were found in the aft part of the vessel [during a site survey in 2012]. The compass card inside the gimbaled mount, shown here, is in an area where the ship’s binnacle would have been located. The two red dots at the bottom of the picture are laser lights that come from the ROV Little Hercules. ROVs often mount two parallel lasers to take measurements and these laser lights are 10 centimeters [2.54 inches] apart. Image courtesy NOAA Okeanos Explorer Program. The most recent exploration of the shipwreck ended Wednesday, when a research team onboard the NOAA vessel Nautilus finished recovering artifacts. Items found on the ship included anchors, navigational instruments, muskets, pistols, swords, cannons, glass bottles, ceramic plates and clothing, according to releases from NOAA and A&M. The Nautilus is scheduled to return to Galveston Thursday, and the artifacts will be transported to A&M’s Cultural Resources Laboratory at the Riverside Campus in College Station, a university spokeswoman said. To help with the 24-hour recovery expedition, A&M Galveston’s Information Services Department built an exploration command center on campus to enable NOAA and university scientists to monitor and help guide the expedition in real time, the university said in a news release Wednesday. The shore-based station was in direct communications with the technicians onboard the Nautilus at the site to advise and help direct the recovery of artifacts, the release said. Communications included live audio and high-definition video. From the remote station on campus, A&M Galveston’s Gilbert Rowe, a marine archaeologist, and lecturer Tom Oertling helped the NOAA team on the Nautilus with identification of marine life and artifacts. Researchers still haven’t identified what type of ship it was or where it came from, but they date the artifacts to between 1800 and 1830, the A&M release said. Evidence retrieved so far suggests the vessel was a warship transporting arms and soldiers, possibly to support either Spain or Mexico in their war with each other, the release said. Besides Spanish and Mexican artifacts, cannons believed to be British were found. Coolness. Now the really revealing-but-un-glamorous work begins, with months of work in the lab to conserve, document and identify the artifacts recovered. To get an idea of the depth at which this team was operating, check out a scale diagram of E/V Nautilus, the sled Argus and ROV Hercules after the jump. C.S.S. Richmond was one of the earliest Confederate ironclads, having been laid down at the Gosport Navy Yard at Norfolk, Virginia, in March 1862, immediately after the completion of the famous C.S.S. Virginia (ex-Merrimack). 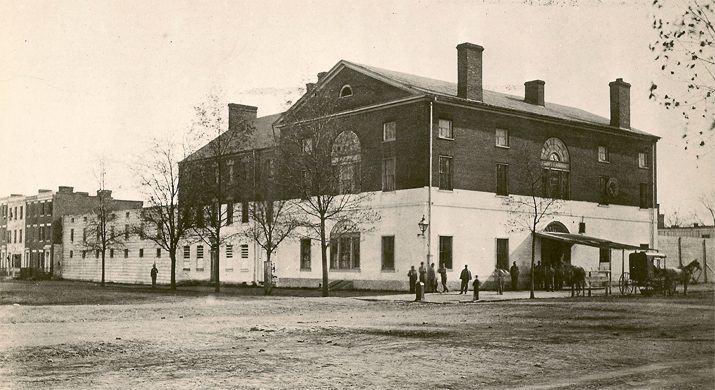 Richmond was designed by John Lucas Porter, who would go on to serve as the Chief Naval Constructor for the Confederacy, but completed under supervision of Chief Carpenter James Meads. Richmond embodied many of the basic design elements that be used, again and again, in other casemate ironclads built across the South in the following three years. Richmond (red) along side C.S.S. Virginia, for scale. When Union forces were on the verge of taking the Gosport Navy Yard, Richmond was hurriedly launched and towed up the James River, where she was completed at Richmond. Finally commissioned in July 1862, the ironclad served as a core element of the Confederate capital’s James River Squadron for the remainder of the war. Richmond, along with the other ironclads in the James, was destroyed to prevent her capture with the fall of her namesake city at the beginning of April 1865. This model is based on plans of the ironclad by David Meagher, published in John M. Coski’s book, Capital Navy: The Men, Ships and Operations of the James River Squadron, with modifications based on a profile of the ship by CWT user rebelatsea, particularly regarding the position of the ship’s funnel and pilot house. 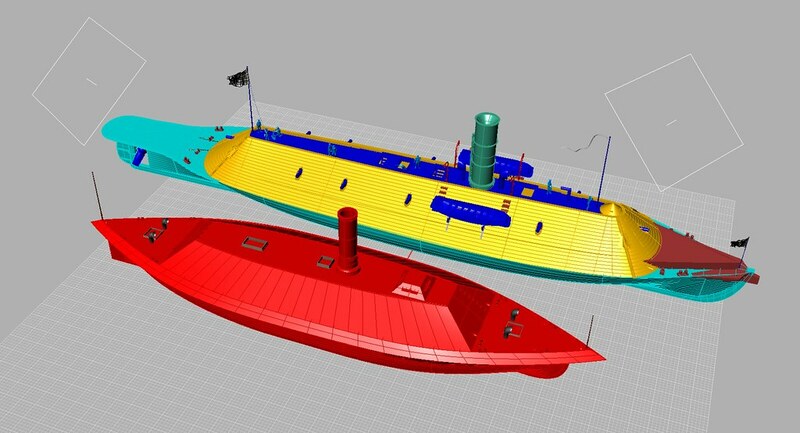 Hull lines are adapted from William E. Geoghagen’s plans for a later Porter design for an ironclad at Wilmington, that seems to have had an identical midship cross-section. Crew members aboard U.S.S. Nahant, one of the last surviving Civil War monitors, pose on deck for a photograph during the Spanish-American War in 1898. The dents in the turret behind them were put there by Confederate shot off Charleston, thirty-five years before. Since we’ve talked a good bit about Civil War-era monitors here, I’d like to share an account of this action by Alvah Folsom Hunter (1846-1933), a sixteen-year-old ship’s boy aboard one of those monitors, U.S.S. Nahant. Hunter had been in the Navy only a few months, and recorded his experiences aboard Nahant in great detail. An annotated edition of Hunter’s diary was published in 1987, edited Craig Symonds. Most of the drawings that accompany Hunter’s account here are by one of his shipmates aboard Nahant, Assistant Surgeon Charles Ellery Stedman. U.S.S. Weehawken’s “devil,” as depicted in the ORN. At noon signal was made from the Ironsides (the flagship) to get under way, and then another delay caught us. It had been ordered that the Weehawken should lead the line of monitors, and some over-wise individual had devised an apparatus for lifting or exploding any torpedoes which might be encountered in the advance. The Weehawken was encumbered with this device, which had been well named “a devil.” “It was formed of very heavy timbers crossing at right angles, bolted together, and was about fifty feet in length, shaped not unlike a boot-jack, the bows of the vessel propelling within the notch. The after-ends, or jaws, of the raft were secured by chains to the bows of the vessel”. There were grapnels to catch the torpedoes suspended beneath this cumbersome raft. When the Weehawken was hoisting her anchor, the chain became entangled with these grapnels, and caused over an hour’s delay before the chain was cleared and the anchor hoisted up. Not only that, but the encumbrance upon her bows made the naturally unwieldy monitor still more unwieldy and difficult to steer, and but for the tide having turned and begun to run flood again, it is doubtful if the Weehawken could have steamed up against the current so as to come within range of Fort Sumter. As the Weehawken was the appointed leader of the line, a delay to her held back the entire fleet. The order of battle was that known as “line ahead,” or, as a soldier would state it, “single file.” The eight monitors were formed into two divisions, with the frigate Ironsides (flagship) between the first and second division. In the first division were the Weehawken, Passaic, Montauk, and Patapsco; in the second the Catskill, Nantucket, Nahant, and Keokuk. The distance between the vessels was intended to be one hundred yards, but they steered so badly it was quite impossible to keep close to distance. The monitors were extremely heavy, unwieldy vessels, steering badly when conditions were at the best. Being in shallow water increased the difficulty of steering, and when steaming ahead very slowly, the difficulty was still further increased; the clumsy vessels were here pretty nearly unmanageable. When the signal to get underway was made, our crew was called to quarters, and those of us who were stationed on the berth deck, where we could hear little and see nothing, found the long wait very trying to our nerves. We knew that the engine was frequently started and then stopped again, and supposed the starting and stopping were but incidents of getting the vessels into line formation, but why the long, long delay in opening fire, we did not know. It was nearly three hours after the call to quarters that we began faintly to hear the boom of the guns of some of the vessels, and it was ten minutes past three o’clock when our two guns were fired in quick succession. The relief we all felt when at last our guns spoke out was very great, and we gladly hastened to such duties as came to us. Passing on to the door of the magazine the call for cartridges and shells, seeing these brought to and passed through the door to the turret chamber, shaking the inverted cartridge tub over the tub of water, and then returning it to the door of the magazine, didn’t call for furious activity on our part, but, it was something to do, and a great relief to our strained nerves. Handling ammunition in the compartment below the turret, by Nahant’s Ship’s Surgeon, C. E. Stedman. The leading division had come into action about three o’clock, and soon after that the Admiral, finding the Ironsides pretty nearly unmanageable in the shallow water and having had to anchor, ordered the signal: “Disregard the movements of the flagship” to be hoisted. This signal at once set free the vessels in the second division and they steamed past the flagship into close action. The Nahant was probably the fastest of the single-turreted monitors, and the Keokuk, next her in line, was even faster. These two vessels, the last in the line, steamed ahead at full speed and were quickly in the thickest of the fight. “Four bells” sounding on the gong in the engine room, which ordered the engineer to go ahead at full speed, was distinctly heard by us on the berth deck, and in a few minutes cannon shot began to strike the Nahant. At first the hits were few and scattering, but, as we drew nearer to Sumter, they were more frequent. Captain Downes stated that we went up to within five-hundred yards of Sumter, nearer to that fort than any other vessel, and the shots came down upon us in an irregular staccato. There was about twenty-five minutes’ time when we were struck on an average about once a minute. Stedman’s drawing of Nahant’s turret in action. Stedman omits much of the internal bracing used in the turret, but captures the action well. One of the heavy shot struck our turret fairly, about two feet above the deck and just over the heads of the three of us boys who were standing near the turret-chamber door, and so tremendous was the impact, we all three instinctively ducked our heads. The solid shot was smashed and we clearly heard the pieces rattling down upon the deck above our heads. While we were coming into close action, our guns were kept as busy as the difficulty of loading and firing them permitted. Both guns were fired seven times each, and a little later the XI-inch gun was brought to bear upon one of the forts and fired for the eighth time, making fifteen shots in all fired by the Nahant. Cross-section through the hull, turret and pilothouse of a Civil War monitor similar to U.S.S. Nahant. Just after we came under the terrific fire which rained down upon us, three heavy shots struck the pilot-house in quick succession. [Unlike the original Monitor, the pilot-house on Passaic Class ships was located atop the turret for maximum all-around visibility.] One of these shots struck just at the base of the pilot-house, where a massive iron ring, some four inches deep by a foot wide, rested upon the top of the turret. This ring was put there as a safeguard, to prevent a shot which might strike there from penetrating at the angle formed by the base of the wall of the pilot-house and top of the turret. The metal of this iron ring was bulged outward and upward, and the inch-thick plates of the pilot-house were bulged outward and downward around the deep dent made by the shot. The result was that the turret and pilot-house were tightly welded together; the turret was “jammed” and could not be revolved. At almost the same instant, a shot struck the pilot-house close beside one of the peepholes which were cut through the walls to give those on duty inside some view of matters outside. The bolts which held the inch-thick plates together were countersunk into the plates on the outside, the nuts being on the inside. Heavy curtains made of two thicknesses of canvas with hair quilted in between hung around the inside of both turret and pilot-house to prevent the heavy nuts on these bolts from flying if the bolts were struck by a shot, but in the pilothouse there had to be holes cut through this curtain where it covered the peepholes. The shot which struck close beside a peephole struck squarely on one of the bolts, the bolt broke off close by the nut inside, the nut and bolt-end being driven across the inside of the pilot-house with the velocity of a solid shot. Stedman’s depiction of the action off Fort Sumter in April 1863, with (l. to r.) Nantucket, New Ironsides and Nahant. Stedman, as was his pratice at the time, gave the first and last of these vessels the fictional names of “Otternel” and Semantecook” in the caption of his drawing. Quartermaster [Edward] Cobb was at the wheel, Pilot [Isaac] Sofield stood a little behind him and was stooping over a bit to observe what could be seen through a peephole on the other side, and Captain Downes was standing a little to one side of the pilot. The flying nut struck Cobb upon the side of his forehead, tearing off a piece of his skull about five inches long by three wide, inflicting a mortal wound. It next struck Pilot Sofield close beside the spinal column at the base of the neck making a deep cut nearly two inches in length and effecting a paralysis of the body because of the shock to the nerves, so that he dropped as though instantly killed. It then glanced upward and struck the top of the pilot-house, then re-bounded downward upon Captain Downes’ foot, inflicting a painful bruise which kept the Captain limping about with the aid of a stout cane for several days. We on the berth deck knew nothing of this tragedy till the turret chamber door opened and three men came through bearing the body of poor Cobb, and my first sight of a wounded man was when I heard a gasping moan, turned around and looked directly down upon the gaping wound on the side of Cobb’s head. Then, for a few seconds, I wished I was back in Boston. The wounded man was borne to the wardroom table, which was requisitioned for a surgery when we went into battle. It was quickly seen that the case was hopeless, the wound was mortal, and the unfortunate quartermaster was tenderly moved to his hammock, which was spread down on the berth deck for him. Two or three mimutes after Cobb had been brought down, the inert body of Pilot Sofield was lowered down from the pilot-house to the turret, then lowered to the chamber below and borne to the wardroom table. I was summoned to make ready the berth in Mr. [Ensign Charles C.] Ricker’s stateroom for Pilot Sofield, and overheard Dr. Stedman telling his assistant that if the blow had struck half-an-inch to the right, it would have killed the pilot, as it would have smashed the spinal column. Striking where it did it made only a deep and painful flesh wound, but the shock to the spinal cord had effected a paralysis. Treating casualties in action on the wardroom table, by Assistant Surgeon Stedman. This scene actually depicts his earlier ship, U.S.S. Huron. Another man was quite badly wounded at just about the same moment as those in the pilot-house, a seaman named John McAllister. He was one of a gun’s crew and was standing beside his gun in the turret. One of the shots striking the turret broke off a piece of iron which weighed seventy-eight pounds. This piece of iron was thrown violently across the turret, in its course striking and bending the rod which operated the steering gear, and then struck down McAllister, injuring him severely. The steering gear was put out of business by this accident, and there we were: helpless, drifting slowly up towards the obstructions and under the fire of a hundred heavy guns. It was fully ten minutes before the supplementary steering gear in the turret-chamber could be got into working condition. When it was working, efforts were made to so steer the ship that the guns could be again trained upon Fort Sumter, but these efforts were futile, and the Nahant was headed out just as the signal for the fleet to withdraw was hoisted on the flagship. The Nahant joined the other vessels and all moved down to the former anchorage. Stedman’s depiction of repairing battle damage on U.S.S. Nahant, this time after a subsequent “set-to” with Confederate gunners at Fort Wagner on Morris Island. Du Pont had been reluctant to stage this attack with naval forces alone; he had urged a coordinated attack, using large numbers of land troops to help secure the batteries around the perimeter of the harbor. The events of April 7 vindicated Du Pont’s original position, as well as showing the limitations of the then-still-new armored ships in attacking heavy, well-trained shore batteries. After Du Pont’s failed attack, the Union strategy shifted to one that prioritized taking the forts on the outer periphery of Charleston Harbor, gradually working toward Sumter itself. If you’ve seen the great Civil War movie Glory, you have some familiarity with that part of the war. Finally, if you haven’t seen his posts lately, my colleague Craig Swain has been doin’ the knowledge on the development of the Confederate defenses at Charleston over at his blog, To the Sound of the Guns. It’s fantastic stuff, in all its primary-source, granular detail. Great work, Craig — you’re showing how it’s done. S. F. Du Pont to Gideon Welles, “Attack by Federal ironclads upon the defenses of Charleston, S. C., April 7, 1863,” April 8, 1863. ORN, vol 14, 3. Alvah F. Hunter, A Year on a Monitor and the Destruction of Fort Sumter, Craig L. Symonds, ed. (Columbia: University of South Carolina, 1987). “Dr. Stedman” was Assistant Surgeon Charles Ellery Stedman, ship’s surgeon aboard Nahant, whose sketches illustrate this post. Charles Ellery Stedman, The Civil War Sketchbook of Charles Ellery Stedman, Surgeon, United States Navy. Jim Dan Hill, ed. (San Rafael, California: Presidio Press, 1976). Sofield’s paralysis may have been temporary; Assistant Surgeon Stedman’s after-action casualty report does not mention the paralysis, and says that Sofield “is doing well.” Pilot Sofield was still on active duty with Nahant at the end of 1863. C. Ellery Stedman, “Report of casualties on the U. S. S. Nahant,” April 7, 1863. ORN, vol 14, 5; John J. Cornwell, “Report of Lieutenant-Commander Cornwell, U. S. Navy, regarding drifting timber from the harbor obstructions,” December 29, 1863. ORN, vol 15, 210-211.